Lydum Mølle near Nørre Nebel in West Jutland, originally a gristmill, was converted into a hydroelectric plant in 1903 to power the mill and grocer's shop. 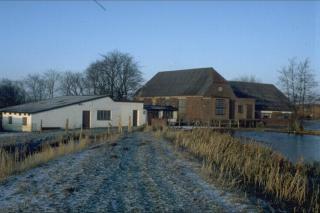 In 1917, the mill was modernised and redesigned as a privately owned plant, supplying the community with direct current. The plant ran on hydropower generated by a water turbine and other motors. As many as 100 other small-scale hydroelectric plants were established during the same period in Denmark. Lydum Mølle was in operation as a hydroelectric plant until 2002 when a local association acquired it for use as a local experience centre. In November 1903 the mill-owner was to hold a wedding for his eldest daughter. This was to be a grand event with electric light in the mill, home and in the large marquee in the yard. A mechanic, one Gudmund Bentsen, who had attended a week's residential course on operation of small-scale hydroelectric plants was contracted to install the machinery, cables and lamps, with the aid of the miller's assistant. On 20 November, local residents were invited to the wedding, which was to last two days. There were festivities and dancing accompanied by local musicians …and there was electrical lighting everywhere, outdoors and in. A sight unseen in West Jutland" as G. Bentsen put it in his memoirs in 1949. "